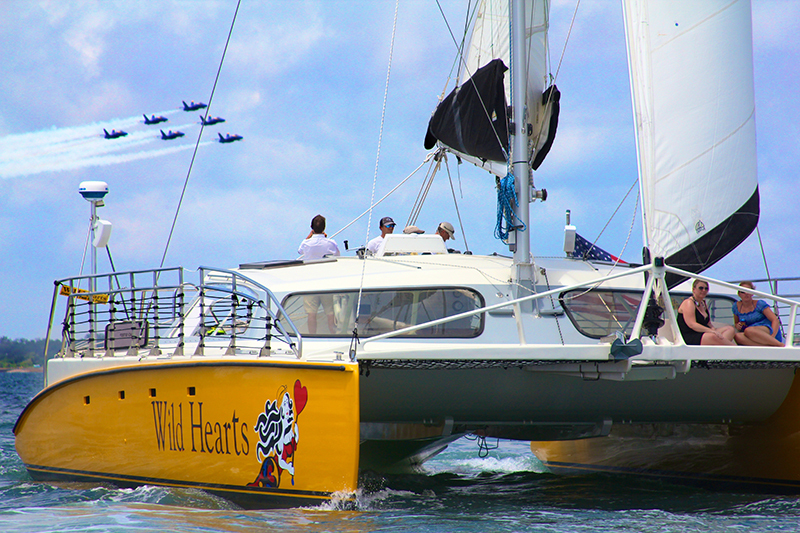 “I feel the need, the need for speed . . .” With Sail Wild Hearts Dolphins & Blue Angels Sail, you can experience just that! On this cruise you will enjoy an extended cruising time, allowing for a wealth of opportunities to view dolphins in the gulf waters. But when the sailboat drops anchor in the waters off Pensacola, Florida, you know it’s time to watch the skies for the Blue Angels, the U.S. Navy’s precision flying team. This team of specially trained pilots calls Pensacola home, providing an opportunity to be wowed by their expertise on a regular basis. The Blue Angels team was established in 1946; throughout the life of the program, more than 250 pilots and 35 flight leaders have been associated with it. Each pilot must complete 120 training flights during the winter in order to perform a public demonstration. Since they fly at incredible speeds and sometimes only 18 inches apart, there is no doubt these talented pilots are among the best in the world. Available most Tuesdays and Wednesdays from April through early November, the 6-hour sailing adventure takes you aboard our 53-foot, open-ocean catamaran. Included in your fee are water, soft drinks and fruit, as well as a light lunch served while enjoying the aerial acrobatics of the Blue Angels. By choosing the Dolphins & Blue Angels Sail on Wild Hearts, you will get to avoid all the traffic hassles and crowded viewing spots while enjoying a perfect vantage point. Book this priceless experience now, as spring dates are already filling up! Please note: Cruises are subject to cancellation due to weather or a change in the Naval operational schedule.